In response to my friend in San Diego, she is absolutely correct. 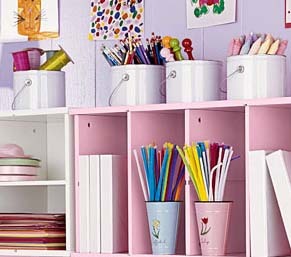 The way to make her playroom fun for her three children and herself is to create stations. I'm going to write about this for the next few entries because there is a lot to cover here. Before we do anything we need to clear the clutter! The best time to do this is in the summer when schedules are not so crazy. Dedicate a full day to this because it's really important. Make three boxes: Trash, Save, Donate. This will help you stay on task. The next thing is storage. Every item needs a home. Children actually enjoy putting things away when they know where to put them. For this space I'd like to use a combination of standard clear plastic bins and fun non-traditional storage items...like flower pots and recycled jars. Next we need to think about our stations. It's a fact that children will gravitate to wherever their parents are so the first thing we need to do is think about Mom. Yay! After creating a yummy space for Mom we will want stations for art, computer/homework, reading, and a fabulous gallery.